I f you're planning a really short vacation in Mexico, you want to get all the juice out of that brief experience. You need insiders' secrets to be sure you don't miss anything really wonderful during such a short stay. That's why I've written my quick guide to the perfect weekend in San Miguel de Allende. In just 36 waking hours, you can get a taste of the best. And like so many of us, you'll probably go home planning your return. This page is Day Three of my version of a perfect San Miguel weekend. To start at the beginning, go to 36 Hours in San Miguel de Allende. Follow the link at the end of the page to Day Two, then follow on back to this page to finish up your perfect San Miguel weekend, part of a wonderful vacation in Mexico. They wake to a lazy morning. By now, they're feeling like real sanmiguelenses. No hurry. They wander off to join new friends for brunch at Café de la Parroquia. The conversation is lively and intelligent, the weather is perfect. They fall in love with the avocado salsa that's set on the table. Francoise, the owner, smiles warmly as she greets everyone and refills the coffee endlessly. As they leave the cafe, they hear music. 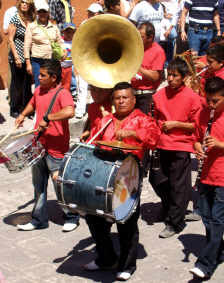 Just as they reach the corner, a band comes walking up Calle Umarán, bouncing brassy oom-pah music off the ancient walls. They're accompanied by mojigangas, the larger-than-life papier-maché figures that are so often a part of any parade in San Miguel de Allende. So what's the occasion for the parade? Who knows? Who cares? Sometimes it seems like every other day in San Miguel offers a fiesta or parade, a procession or fireworks. Maybe it's just that the folks in San Miguel understand that life itself is reason enough to celebrate. There's time for one last San Miguel de Allende tradition. Hailing a taxi, they go to La Gruta, one of the natural hot springs a few miles out of town. The first pool they enter is bathtub warm. Then they wade through a long, dark tunnel into the innermost pool. Cavelike, almost womblike, it wraps them in its heat. There is simply nothing to do here but relax totally, feel the heat seep into every pore and muscle and listen to the water drip from the stone ceiling domed high above them. Limp and so relaxed they can barely walk, our travelers ride back to the hotel to change. There's just time for a final farewell drink at the beautiful Sunset Bar on the roof of Casa Linda, on Mesones. A Tequila Sunrise is the perfect grace note to their vacation in Mexico. Back to the Casa Luna to gather their bags and say a final good-bye to Diane and Suzanne. Sadly, the shuttle van is at the door to take them to the airport in León. They're feeling both tired and energized at the same time. A new life-dream is being dangled in front of their faces. They'll sleep on the plane home...and dream about how soon they can return to San Miguel de Allende for another vacation in Mexico... or maybe a whole new life. So what would YOUR perfect weekend in San Miguel de Allende look like? We'd love to hear how you'd spend 36 perfect hours in San Miguel. Send us your stories. Include recommendations for hotels, restaurants, activities, or anything else that would make your weekend in San Miguel ideal. We may add them to this section. To send your submission, go to Your Perfect Weekend in San Miguel de Allende.